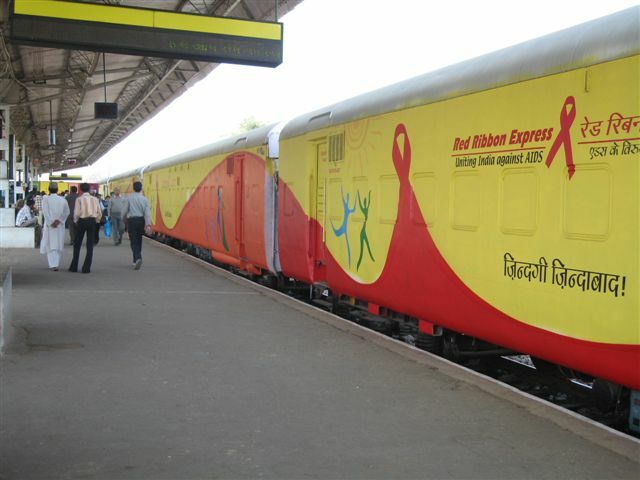 Red Ribbon Express (RRE) is one of the flagship initiatives under the National AIDS Control Programme that was successfully implemented twice in the past. Based on the overwhelming response received during the last two phases, the third phase of RRE was flagged off from Delhi on 11th January 2012, the National Youth Day. On a year long journey the special train will pass through 23 states covering 162 railway stations. RRE entered West Bengal on 16th July 2012. It is scheduled to halt at 12 stations for 22 days in the state. Since 1992, when the comprehensive National AIDS Control Programme was launched in all States in the country. Since then, there has been a considerable expansion of the services for HIV/AIDS prevention, treatment, care and support. The HIV estimates 2010 show an overall reduction in HIV prevalence and incidence in India. The estimated number of new annual HIV infections has declined by more than 50% over the past decade. It is estimated that India had approximately 1.2 lakh new HIV infections in 2009, as against 2.7 lakh in 2000. This is a significant indicator of the impact of the various interventions and scaled-up prevention strategies. The third phase of RRE is being organized in collaboration with Ministry of Railways, NRHM and key mainstreaming partners in order to further strengthen the on going mainstreaming efforts. This time, it was launched on 11th January, the birthday of Swami Vivekananda which is celebrated as the National Youth Day. Besides disseminating information regarding primary prevention and services, RRE-III aims at reducing stigma & discrimination against People Living with HIV/AIDS and strengthening people’s knowledge, while focusing on youth in particular, about the measures to be taken to prevent HIV/AIDS and adopting preventive health behaviour.